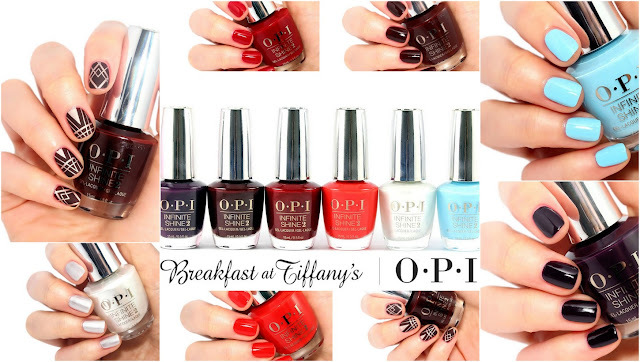 Here I am with swatches of the new OPI collection for the holidays inspired by the Audrey Hepburn and Breakfast At Tiffany's! 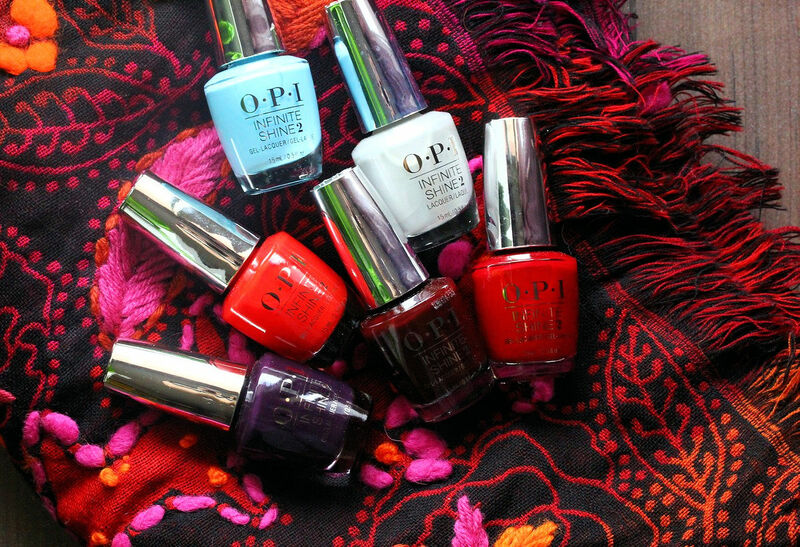 The words famously uttered by film and fashion icon Audrey Hepburn could not ring truer at OPI. That’s why OPI is unveiling Breakfast at Tiffany’s, a holiday collection that captures the elegance and effervescence of Audrey as Holly Golightly in the American cinema classic. 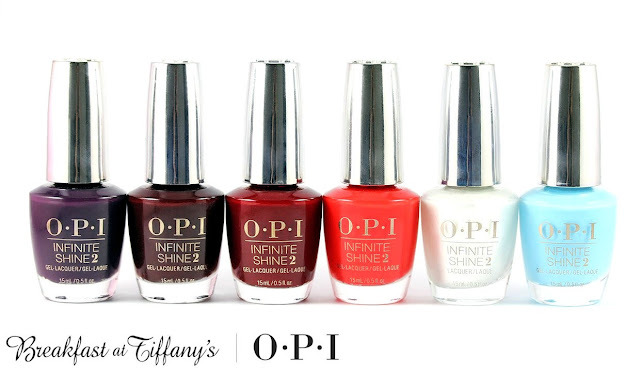 This collection consists of 12 nail lacquer shades. All shades are also available in GelColor. 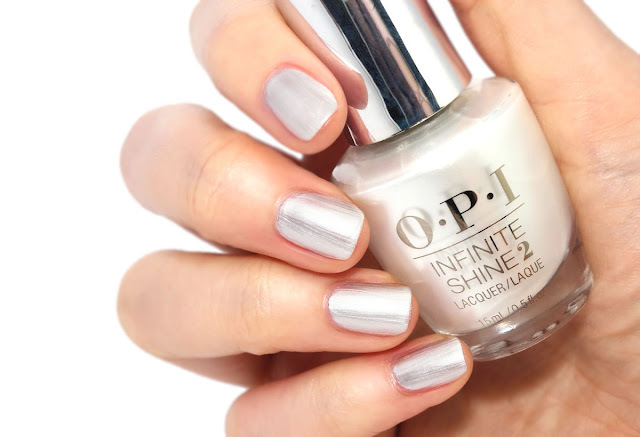 I Believe in Manicures (the light blue) alongwith five additional new shades are also available in OPI’s Infinite Shine No Light Gel Lacquer formula, part of a three step gel lacquer system that offers long wear, shine and ease of removal. I've already talked about Infinite Shine polishes HERE so have a look if you're curious about this formula. In short, Infinite Shine polishes, when used with the corresponding base and top coat last a couple of days longer than traditional polishes. I can typically wear them for about 6 days without chipping. For all polishes, I used 2 coats of polish and used the OPI Infinite Shine base and top coat. Can’t Tame a Wild Thing - This daring red is too free to let anyone pin it down. 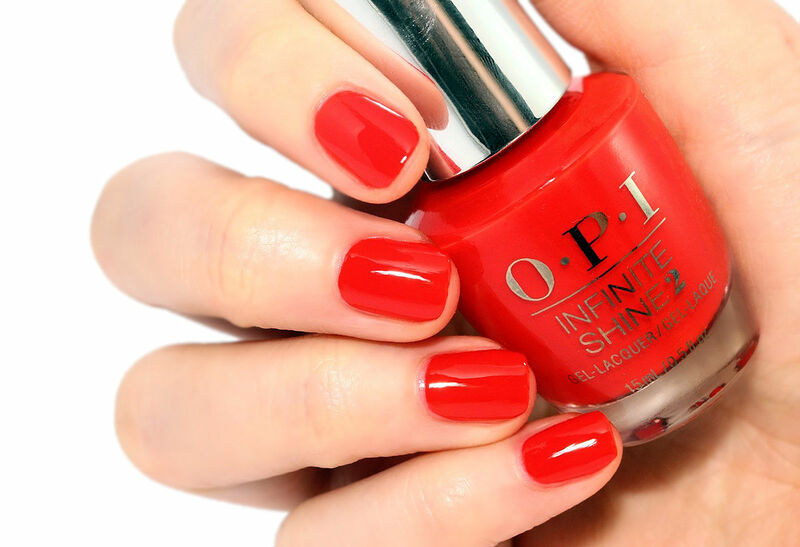 It's a super bright tomato red, perfect formula (it's a jelly), perfect color. 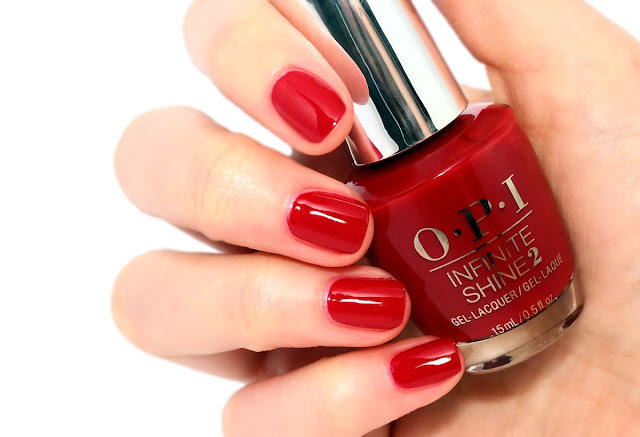 It's a classic and chic shade. I really like it! Girls Love Pearls - Just like this lustrous silver, they add a touch of class to everything. It's really frosty and not my cup of tea. From afar it looks decent and not that bad though. 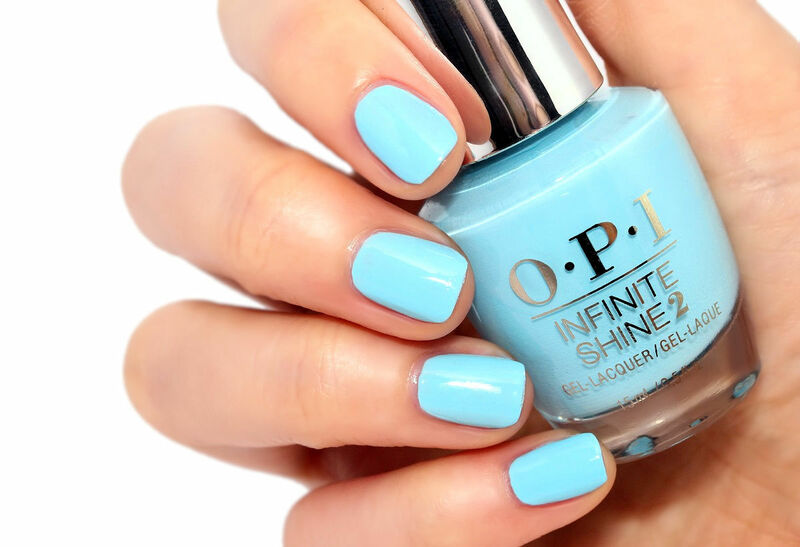 I Believe in Manicures - And I believe in this precious, light blue. Super fresh and original color that will make a statement for sure. I also really like it. 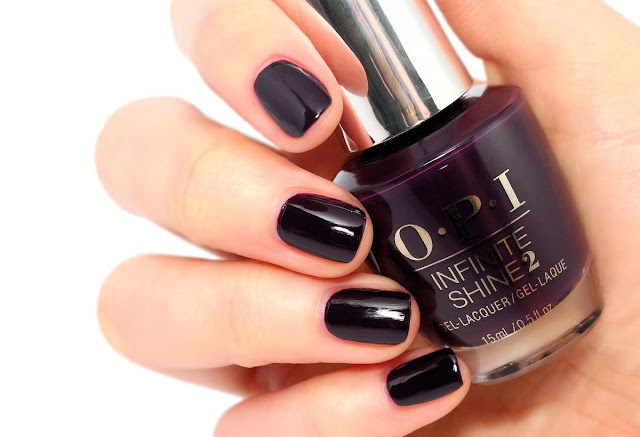 I’ll Have a Manhattan - This sleek dark purple mixes perfectly with classic cocktails. It's a very dark purple but not too dark to look black. It dries darker than in the bottle. 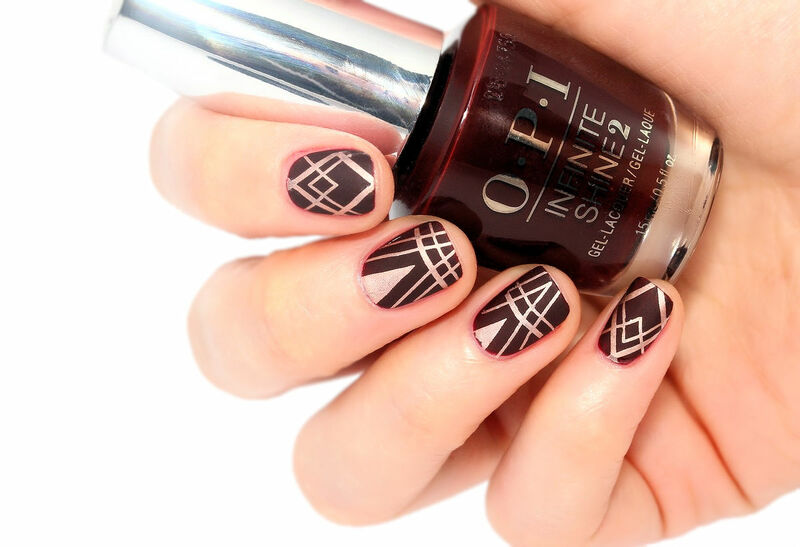 If like me, you like dark colors, this one is for you! This is is opaque in 1 coat. Party at Holly’s - Come by at 6, this burnished mahogany is the perfect access to a wild night. It's a very dark red, super glossy and pretty. If you have to clean up be careful because it can temporarily stain the cuticles a little if you go overboard with acetone or nail polish remover. I said temporarily because I did my mani before going to bed and when I woke up, it was gone so not a real stain. The mani lasted 6 days on me and my nails were not stained upon removal. Ring the Buzzer Again - Anyone who wears a scarlet this rich is too fabulous to carry a key. 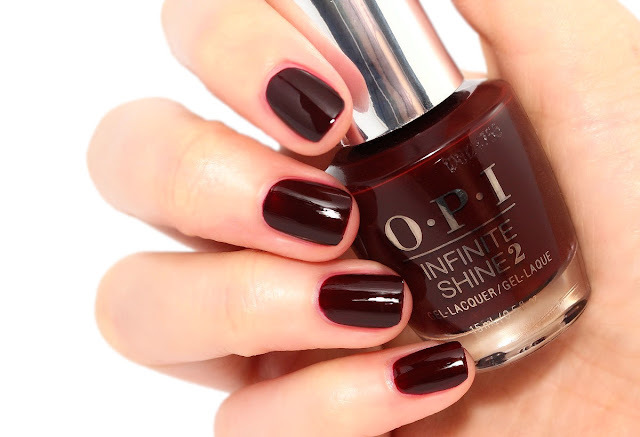 It's a dark red with brown undertones, a perfect fall polish in my opinion. Overall, I really like all the shades except Girls Love Pearls. The formula on all colors was good and they were all opaque in 2 coats. 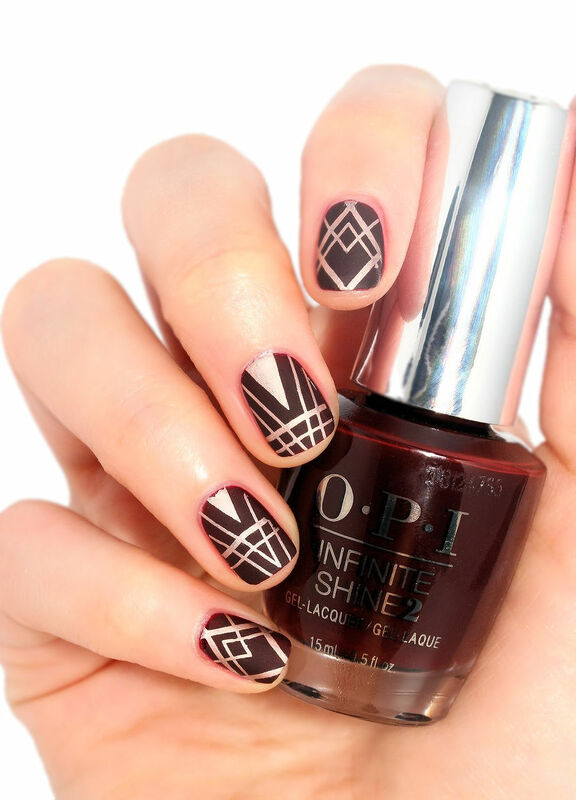 I also did a nail art with Party At Holly's using Moyou Holy Shapes 04 Image plate. I used OPI matte top coat on top. I have to say that the mani started chipping after only 2 days so yes, I guess you really have to use the Infinite Shine base and top coat with the Infinite Shine lacquers!